In only a few weeks, football players across the United States will return to the field for the start of another football season. Those early August days also signal the highest temperatures of summer. Without proper hydration, outdoor practices, games and physical activity can lead to heat illness and decreased performance. 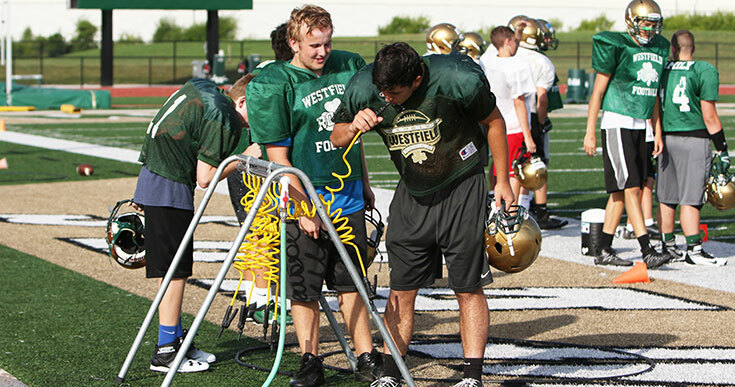 It is crucial that coaches, players and parents are aware of the signs and symptoms of heat illness and the proper hydration techniques necessary to combat its onset. Dr. Patrick Kersey, the USA Football medical director and a sports medicine physician at St. Vincent Sports Performance in Indianapolis, said heat illness can cause tissue and muscle to break down. In advanced stages, it can even cause organ to start failing. According to Kersey, a severely dehydrated player can no longer maintain normal body functions. Organs lose their ability to regulate temperature, eventually causing them to overheat and shut down. The most effective ways to prevent heat illness is to recognize the early signs and symptoms. If players are exhibiting any of the following symptoms, they should rest and rehydrate immediately. It is important to remember that heat illness comes in many forms. Different athletes will exhibit different symptoms depending on the stage. If a player exhibits any of these symptoms, remove them from the exercise, move them to a cool, shaded area, remove their equipment and loosen the clothing to lower core temperature. Most importantly, make sure they continue to hydrate. There are several easy ways to prevent heat illness and heat exhaustion. The following hydration tips and techniques can help protect players from heat illness, even on the hottest days. Consume 6 to 8 ounces of water eight times a day. Use the urine test: The color of a player&apos;s urine should be clear to slightly yellow (lemonade). If it&apos;s darker in color, he or she is not properly hydrated. Water (bottled or tap) and electrolyte replacement drinks (such as Gatorade) should be encouraged before, during and after games and practices. Hydrate before physical activity. Most athletes are dehydrated before they even step on the field of play. It&apos;s important to begin exercise fully hydrated. After physical activity, athletes can continue sweating for up to an hour. They&apos;re still losing fluids that need to be replenished, so continue to hydrate. Mark Kovacs, director of the Gatorade Sport Science Institute in Barrington, Ill., works with an extensive team of scientists and educators to improve athlete performance through sport nutrition research. He said electrolytes help with processes in the body, and it is important to maintain ideal ranges of them. According to Kovacs, electrolyte replacement drinks, such as Gatorade, provide several benefits that water does not. Unlike water, sports drinks contain carbohydrates, an important component that is converted by the body into energy. Although water is best for hydrating, it does not provide any carbohydrates. Kovacs suggests that athletes who have been performing for longer than 30 minutes consume a product with carbohydrates for energy and electrolytes to replace those lost in sweat. Another key benefit is taste. For more information on proper hydration techniques and other health-related tips for athletes, visit the Gatorade Sport Science Institute website at www.gssiweb.org.